The aim of this study is to investigate the effects of political decision-making process and political actors on financial development. The impact of political factors was investigated in 48 underdeveloped and developing countries employing dynamic panel data analysis for 1985-2012 period, using nine explanatory variables grouped under two subheadings: ‘the political system and parliamentary structure’ and ‘the political stability’. The results show that the level of democratization has significant inverse U-shaped effect on financial development. While the higher government votes increase the financial development, but coalition governments affect adversely. Institutions and rules that limit the powers of the executive have no significant effect on financial development. With regard to variables representing political stability, the results show that political crises, the frequency of cabinet changes, legislative elections and political corruption limit the financial development, while there is no significant effect of the government's term of office. Bu çalışmanın amacı politik karar alma süreci ve aktörlerinin finansal gelişim üzerindeki etkisinin araştırılmasıdır. Politik faktörlerin etkisi, ‘politik sistem ve meclis yapısı’ ile ‘politik istikrar’ olmak üzere iki alt başlık altında gruplandırılan dokuz açıklayıcı değişken kullanılarak, 48 az gelişmiş ve gelişmekte olan ülkede 1985-2012 dönemi için dinamik panel veri analiz yöntemi ile incelenmiştir. Analiz sonuçları, demokratikleşme düzeyinin finansal gelişim üzerinde anlamlı ters-U şeklinde etkiye sahip olduğunu, hükümetin oy oranının finansal gelişim üzerinde olumlu, koalisyon şeklindeki hükümetlerin olumsuz etkisi olduğunu, yürütme organının yetkilerini sınırlayan kurum ve kuralların ise anlamlı bir etkisinin olmadığını göstermiştir. Politik istikrarı temsil eden değişkenler açısından elde edilen sonuçlar ise siyasi krizlerin, kabine değişim sıklığının, milletvekili seçimlerinin ve politik yolsuzluk düzeyinin finansal gelişimi engellediğini, hükümetin görev süresinin ise anlamlı bir etkisinin olmadığını göstermiştir. Acemoğlu, D.; Johnson, S.; Robinson, J. A. (2005), “Institutions as a Fundamental Cause of Long-Run Growth”, (Ed. Philippe Aghion ve Steven N. Durlauf), Handbook of Economic Growth, Volume 1A., Chapter 6, Elsevier: 386-472. Anwar, S.; Cooray, A. (2012), “Financial Development, Political Rights, Civil Liberties and Economic Growth: Evidence from South Asia”, Economic Modelling, C. 29, S. 3: 974-981. Arellano, M.; Bond, S. (1991), “Some tests of Specification for Panel Data: Monte Carlo Evidence and an Application to Employment Equations”, Review of Economic Studies, C. 58: 277–297. Arellano, M.; Bover, O. (1995), “Another Look at The Instrumentalvariable Estimation of Error-Components Models”, Journal of Econometrics, C. 68: 29–51. Asteriou, D.; Siriopoulos, C. (2000), “The Role of Political Instability in Stock Market Development and Economic Growth: The Case of Greece”, Economic Notes by Banca Monte dei Paschi di Siena Spa, C. 29, S. 3: 355-374. Ayadi, R.; Arbak, E.; Naceur, S. B.; De Groen W. P. (2015), “Determinants of Financial Development Across the Mediterranean”, (Ed. Ayadi R., Dabrowski M., De Wulf L., Economic and Social Development of the Southern and Eastern Mediterranean Countries, Cham, Springer: 159-181. Bacerra, O.; Cavallo, E.; Scartascini, C. (2012), “The Politics of Financial Development: The Role of Interest Groups and Government Capabilities”, Journal of Banking&Finance, C. 36: 626-643. Baxter, M.; Jermann, U.J. (1997), “The International Diversification Puzzle is Worse than You Think”, American Economic Review. C. 87: 170–180. Beck, T.; Demirgüç-Kunt, A.; Levine, R. (2001), “Law, Politics, and Finance”, Policy Research Working, Paper No: 2585, World Bank, Washington, DC. Beck, T.; Demirgüç-Kunt, A.; Levine, R. (2003), “Law, Endowments, and Finance”, Journal of Financial Economics, C. 70: 137-181. 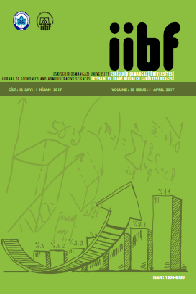 Begović, B.; Mladenović, Z.; Popović, D. (2017), “Democracy, Financial Development, and Economic Growth: An Empirical Analysis”, CLDS Working Paper, WP No. 0317. Bhattacharyya, S. (2013), “Political Origins of Financial Structure”, Journal of Comparative Economics, C. 41, S. 4: 979-994. Białkowski, J.; Gottschalk, K.; Wisniewski, T. P. (2008), “Stock Market Volatility Around National Elections”, Journal of Banking & Finance, C. 32, S. 9: 1941-1953. Blundell, R.; Bond, S. (1998), “Initial Conditions and Moment Restrictions in Dynamic Panel Data Models”, Journal of Econometrics, C. 87: 115–143. Bordo, M. D.; Rousseau, P. L. (2006), “Legal-Political Factors and The Historical Evolution of the Finance-Growth Link”, NBER Working Paper Series, No: 12035. Boudriga, A.; Ghardallou, W. (2012), “Democracy and Financial Development: Does the Institutional Quality Matter” First draft, https://pdfs.semanticscholar.org/3193 (Erişim 21.06.2018). Boyd, J.H. ; Levine, R.; Smith, B.D. (2001), “The Impact of Inflation on Financial Sector Performance”, Journal of Monetary Economics, C. 47, S. 2: 221–248. Bzhalava, E. (2014), Determinants of Financial Development, Master Thesis, Charles University in Prague, Faculty of Social Sciences, Institute of Economic Studies, Prague. Civilize, S.; Wongchoti, U.; Young, M. (2015), “Military Regimes and Stock Market Performance”, Emerging Markets Review, C. 22: 76-95. Degryse, H.; Lambert, T.; Schwienbacher, A. (2016), “The Political Economy of Financial Systems: Evidence from Suffrage Reforms in the Last Two Centuries”, Economic Journal, C. 128, S. 611: 1433-1475. Dimic, N.; Orlov, V.; Piljak, V. (2015), “The Political Risk Factor in Emerging, Frontier, and Developed Stock Markets”, Finance Research Letters, C. 15: 239-245. Döpke, J.; Pierdzioch, C. (2006), “Politics and The Stock Market: Evidence from Germany”, European Journal of Political Economy, C. 22, S. 4: 925-943. Falahaty, M.; Hook, L. S. (2013), “The Determinants of Financial Development: New Evidence from the Middle East and North Africa Region”, Journal of Economic Cooperation & Development, C. 34, S. 3: 35-60. Gärtner, M.; Wellershoff, K. W. (1995), “Is There an Election Cycle in American Stock Returns?”, International Review of Economics & Finance, C. 4, S. 4: 387-410. Ghardallou, W.; Boudriga, A. (2014), “Financial Development and Democracy is the Relationship Non-Linear?”, The Economic Research Forum (ERF) Working Paper Series, No: 886. Girma, S.; Shortland, A. (2008), “The Political Economy of Financial Development”, Oxford Economic Papers, C. 60, S. 4: 567-596. Haber, S.; Perotti, E. (2008), “The Political Economy of Financial Systems”, Tinbergen Institute Discussion Paper, 045/2. Herger, N.; Hodler, R.; Lobsiger, M. (2008), “What Determines Financial Development? Culture, Institutions or Trade”, Review of World Economics, C. 144, S. 3: 558-587. Huang, Y. (2010), “Political Institutions and Financial Development: An Empirical Study”, World Development, C. 38, S. 12: 1667-1677. Huang, Y. (2011), Determinants of Financial Development, Palgrave Macmillan UK. Laeven, L.; Valencia, F. (2012), Systemic Banking Crises Database: An Update. IMF Working Paper WP/12/163. Keefer, P. (2008), “Beyond legal Origin and Checks and Balances: Political Credibility, Citizen Information, and Financial Sector Development”, (Eds. Haber, S., North, D., Weingast, B.) Political Institutions and Financial Development. Stanford, CA, Stanford University Press: 125–155. Kupava, A. (2012), The Political Economy of Access to Finance: The Case of Belarus, Master Thesis, Department of Economics Tilburg University. La Porta, R.; Lopez-de-Silanes, F.; Shleifer, A.; Vishnyi R. W. (1998), “Law and Finance”, Journal of Political Economy, C. 106, S. 6: 1113-1155. La Porta, R.; Lopez-de-Silanes, F.; Shleifer, A.; Vishnyi R. W. (1997), “Legal Determinants of External Finance”, The Journal of Finance, C. LII, S. 3: 1131-1150. Levine, Ross (2005), "Finance and Growth: Theory and Evidence", (Ed. Philippe Aghion & Steven Durlauf), Handbook of Economic Growth, Elsevier, chapter 12: 865-934. Pástor, Ľ.; Veronesi, P. (2013), “Political Uncertainty and Risk Premia”, Journal of Financial Economics, C. 110, S. 3: 520-545. Pinto, P. M.; Weymouth, S.; Gourevitch, P. (2010). “The Politics of Stock Market Development”, Review of International Political Economy, C. 17, S. 2: 378-409. Rachdi, H.; Mensi, S. (2012), “Does Institutions Quality Matter for Financial Development and Economic Growth Nexus? Another Look at the Evidence from MENA Countries”, The Economic Research Forum Working Paper Series, No: 705. Rajan, R. G.; Zingales, L. (2003), “The Great Reversals: The Politics of Financial Development in the Twentieth Century”, Journal of Financial Economics, C. 69: 5-50. Raza, S. H.; Shahzadi, H.; Akram, M. (2014), “Exploring the Determinants of Financial Development (Using Panel Data on Developed and Developing Countries)”, Journal of Finance and Economics, C. 2, S. 5: 166-172. Roe, M. J.; Siegel, J. I. (2011), “Political Instability: Effects on Financial Development, Roots in The Severity of Economic Inequality”, Journal of Comparative Economics, C. 39, S. 3: 279-309. Roodman, D. (2009), “How to do xtabond2: An Introduction to Difference and System Gmm in Stata”, The Stata Journal, C. 9, S. 1: 86-136. Voghouei, H.; Azali, M.; Law, S. H. (2011), “Does The Political Institution Matter for Financial Development?”, Economic Papers: A journal of applied economics and policy, C. 30, S. 1: 77-98. Voghouei, H.; Azali, M.; Jamali, M. A. (2011), “A Survey of The Determinants of Financial Development”, Asian-Pacific Economic Literature, C. 25, S. 2: 1-20. Yang, B. (2011), “Does Democracy Foster Financial Development? An Empirical Analysis”, Economics Letters, C. 112, S. 3: 262-265.